Grease your baking pan / grill tray / flat roasting pan with olive oil and preheat on high (400 degrees F for oven) for 5 – 6 minutes. Put the pumpkin wedges on the heated pan / tray and roast for 10 minutes. Melt the butter and combine the salt, sugar and spices into it. Toss well and let the sugar dissolve completely. 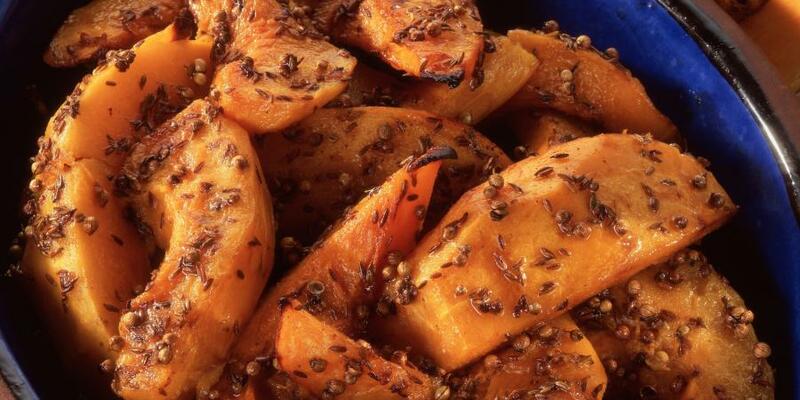 Pour this mixture over roasted pumpkin wedges and toss to coat. You could also put the roasted wedges into the butter mixture and then toss gently to coat. Again roast the wedges for 10 – 15 minutes to set the crust and make them tender and brown. Serve hot without / with choice of dip.